The fog rolled into Cronin Field early, layering the pitch with a thick, spooky haze. As Mountainside muted Jesuit's record-breaking offense, holding the top team in the state to a single goal, the murk coagulated, cloaking the field with lake effect-like condensation. Jesuit, after blasting every team in its path all season led just 1-0 at the half of the all-Metro League Class 6A semifinal against the Mavs. Michael Jackson's "Thriller" blared through the sound system while the teams converged at the half, as if the Jesuit public address announcer was inviting the Crusaders' old playoff demons back home. But the ghosts of Crusader past this was not. This isn't 2013 or 2016, when two similarly jacked Jesuit teams fell victim to the postseason perils. Sunset legend Bridgette Skiba wasn't here to haunt Jesuit. Neither was Tualatin star Emily Leonard. The 2018 Crusaders are as close to unbeatable as any team in state history — checkered past or not. 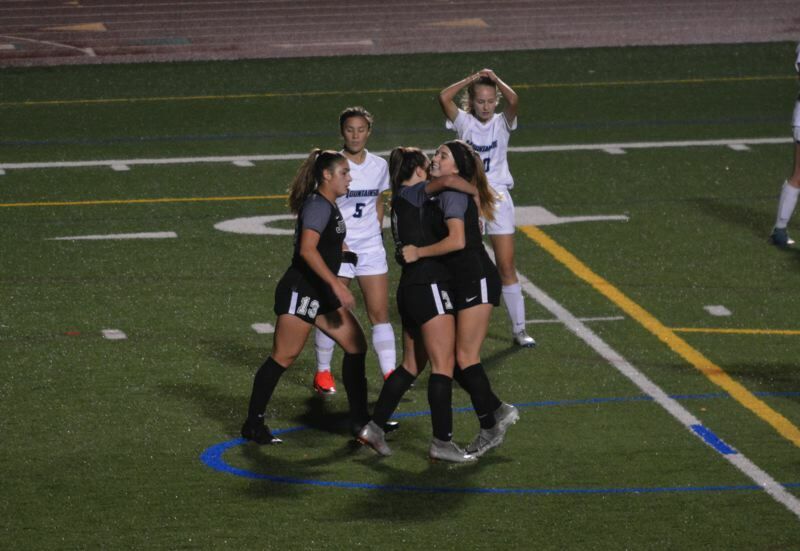 While the upstart Mavericks made more headway against Jesuit than perhaps any team this season, it was no match for the Crusaders who scored twice more in the second half and clinched a spot in the 6A title game with a 3-0 win over Mountainside on Tuesday at Jesuit High School. "It never gets old," Jesuit junior goalie Mary Votava said with a smile. "It's exciting, especially because we've been working so hard. This was one of more challenging games and we all just came together. Mountainside stepped it up big-time. They were pressing fast and we were caught on our heels a little bit in the beginning. But we couldn't control them. We just took a deep breath and decided we just had to play our game." Jesuit junior Callan Harrington scored the first goal of the game off a perfect seeing-eye pass from Maddie Koleno. And senior superstar midfielder Katie Duong had a huge hand in both second-half goals, feeding sophomore Allison Sasaki on a beautifully dispersed pass in the final third for a score and finishing a 25-yard projectile herself. "The team worked so hard for this, we definitely deserve it," Sasaki said. "It's effort, heart and passion." Duong was everywhere all night. 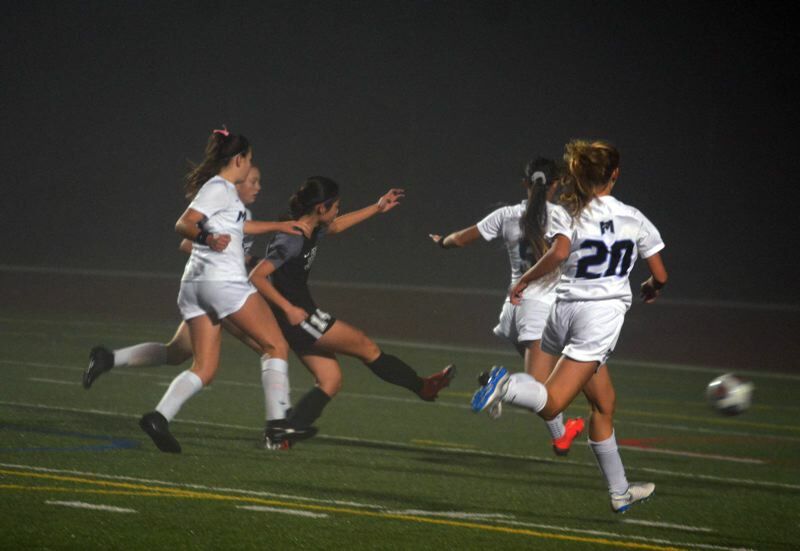 The first-team all-Metro selection fostered her innate connection with Jesuit's forwards, but Duong's shots on frame were ferocious and her timely defense dropping back chipped into the shutout. Jesuit is in perpetual motion all the time on offense, passing, cutting, moving off the ball. They freelance within the framework of the offense with Duong playmaking in the middle. "They never cease to amaze me," Votava said. "Katie is so intuitive to where everybody is going to be. She's in the flow. She knows where everything is going. She never stops and starts. She's always moving. Coach (Steve Fennah) wants us to work together, but we're all so close that it comes naturally. It shows out there how tight we are." Frankly, before the season nobody believed Mountainside would make it this far. Would the Mavericks compete in Metro? No doubt. But reach the semifinals and give Jesuit a game on the road? It seemed like a far stretch back in August. But the Mavericks, without a senior on the roster, playing at the varsity level for the first time in school history, superseded all expectations, even their own. "Everyone at our school was saying 'Good luck' because I don't think they had any confidence in us, but our team knew we could come out and battle against them," Mountainside junior goalie Sidney O'Billovich said. "We played really well together. It was cool to play that type of game." Mountainside's motives against Jesuit varied from some of the radical game plans other opponents tried to use to quell the Crusaders. They put five defenders in the back to help mark up, but the Mavericks weren't afraid to push forward on offense and attempt counterattacks. Metro Player of the Year Nedya Sawan and Stella Bauman pressed into Jesuit territory, using dribbling skills and footwork to get free and carry the ball into the Crusader backline. O'Billovich made a handful of unbelievable saves, including four in the second half alone. And Mountainside's backline of Izzie Carrington, Emma Weber and Bethany Newton held up when thrusted into one-on-one do-or-die scenarios with Harrington, Koleno and Namoi Alvarez. "We've been prepping for this game for literally six months," O'Billovich said. "We were talking about how we just wanted to make it as far as we can. Losing 3-0, it sounds cliché, but I'm really proud of our team." To allow just three goals and six shots from a team some already consider the best in Jesuit history is a credit to the Mavericks' fortitude. And with nobody graduating and a few transfers possibly trickling in, Mountainside will be back in earnest come '19. Tuesday was merely the first of what should many high stake playoff affairs moving forward for the Mavs. "We know how well we can play and from here on out we can only get better," O'Billovich said. "That's something we can long forward to. We were not sad after this game. We were just kind of happy to be here and play like this and play together. We're so thankful we got this far and so thankful for these experiences." After three postseason games of watching her opponents flail attempts nowhere near her vicinity, Votava had a shot on goal come her way and caught it off Mountainside in the second half. Votava said that was just the sixth shot taken on goal against her all year and she relished the one-time opportunity. "It was entertaining for me," Votava said with a smile. "I got a little nervous. I was like 'Oh, this is your one, don't mess it up'. My defense takes pretty good care of me back there, so I don't have a busy time, usually. I focus on keeping the tempo of the game right and my mentality in it, just in case that one shot comes. You don't want to let it in." No. 1 Jesuit will play No. 6 Clackamas at Hillsboro Stadium on Saturday at 6 p.m. Good luck, Cavs. This Crusader team is deep with deadly playmakers, a well-tuned offense that's scored 120 goals on the year, a defense that's allowed one fluke goal all season and a goalie in Votava who's already committed to Notre Dame as a junior. Jesuit is coming off a state title in '17 and is the prohibitive favorite to repeat come Saturday evening. Crazy things happen all the time in soccer and Hillsboro Stadium has been known to wreak havoc with its strange wind currents that sometimes rip through the arena. But there's a feeling of inexorability about the Crusaders that few forces of nature can contend with. "We treat everyone the same, we expect Clackamas to be the best team we've ever played," Votava said. "We can only control us, so we can only play our game. We want to come out fast and strong no matter what we're doing and show them we're here to play. We can keep getting better."